World's #1 Professional External Hard Drive Data Recovery to Help you Get Lost Data Back from Top Brands of External Hard Drives Like WD, Seagate, Toshiba, Transcend, omega, Buffalo. Recover data due to unintentionally deletion, accidental formatting, virus attack, etc. 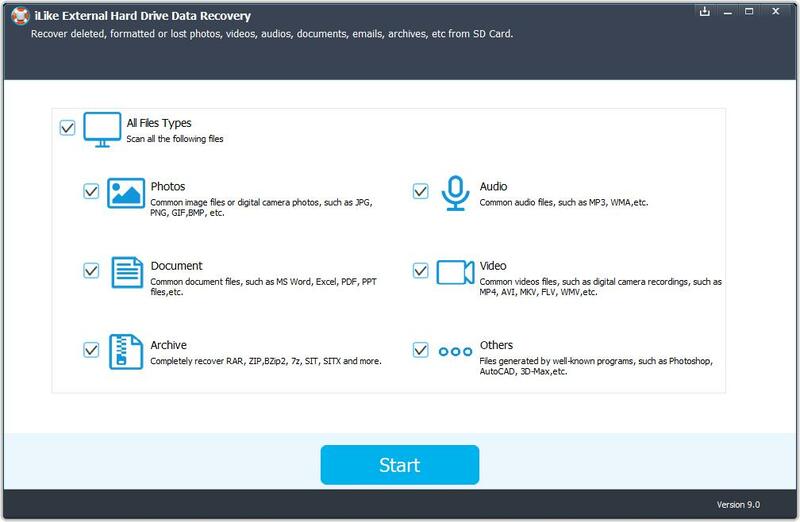 Recover pictures, videos, documents, folders, emails, etc. Why iLike External Hard Drive Data Recovery? An external hard drive is an excellent storage device for photos, videos, documents, and important business information because they have a high storage capacity and are extremely portable. They are, however, still a hard drive with moving parts which can be easily damaged by hardware failure, human error, computer viruses, power surges, natural disasters, or software/program corruption. An external hard drive is just susceptible to data corruption, just like the hard drive in your computer. External hard drives are also the leading form of storage media from which people most often lose their data. iLike External Hard Drive Data Recovery offers data recovery services for all makes and models of external hard drives which can recover lost files due to deletion, format, raw, virus attack, system crash etc. from external hard drive easily.